A chic 9ct white gold ring, set with two rows of claw set diamonds separated by a simple bar for a contemporary look. Complete with a quarter carat of diamonds and a sophisticated, polished finish, this is the perfect item of glamour for all occasions. Diamond's are a girl's best friend. 9ct white gold two row 0.25ct diamond ring is rated 5.0 out of 5 by 3. Rated 5 out of 5 by Anonymous from Stunning ring This is my wedding ring. It is stunning and very sparkly. It is great quality and feels sturdy. Rated 5 out of 5 by Anonymous from Very Sparkly and well worth the price. Looking forward to wearing this in March :) I love this Ring. 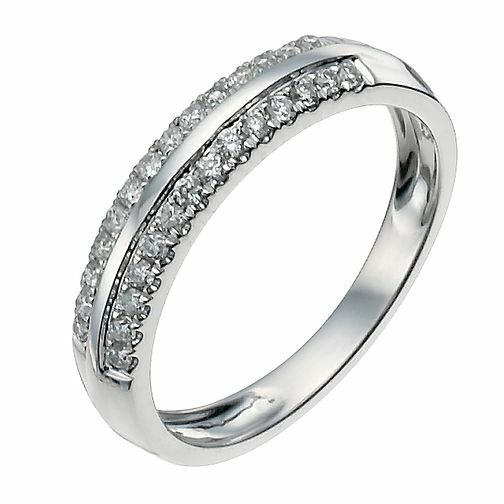 Looking foward to wearing this from March :) Very Sparkly wedding band. Very Happy with my purchase. Exchanged my original choice and paid a little bit extra for this one.